The last several years have seen increasing interest in entomology, particularly from those who have recently started flyfishing. At least, that seems to be the case, based on postings from various flyfishing forums. 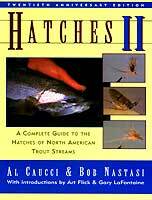 However, there has not been much comparative analysis of the various flyfishing entomology books. Hopefully, this article will provide the reader with sufficient information to make more-informed choices. 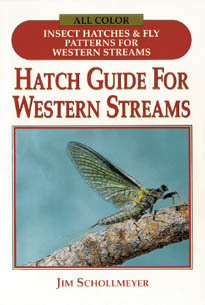 Some books cover most aquatic insect orders, some even cover other aquatic vertebrates, while others focus on a single aquatic insect order, mayflies for example. Some books cover only the immature (nymphal/larval/pupal) life stages, whereas others also cover the adult life stage (or stages). The (taxonomic) level (of description) for books covering multiple insect orders tends to not be below the family (or genus) level. Conversely, the level of description (for books covering a single order or insects) is more likely to go down to species level. Most books are rich in illustration. This may include drawings or photos, and in black & white and/or color. Some books deal with imitation by suggesting patterns, presentation techniques, and emergence timing, while others don’t. Also, these books can vary greatly in such other characteristics as: their scope of geographic coverage; the degree to which their taxonomy has become out-of-date (largely a function of publication date); their availability new (still being published); and their size as measured in number of pages. So, in order to present all this information to the reader in a consistent manner, use of a matrix was chosen. 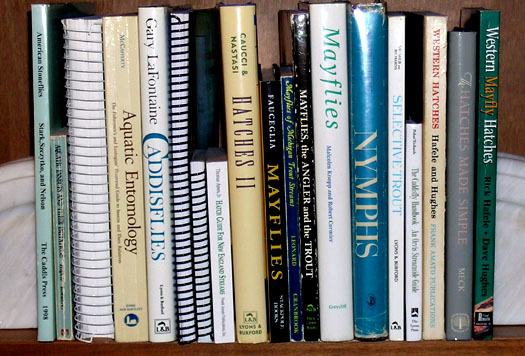 The column headings include the (above) information categories, and the rows are populated with descriptive information from my the entomology books on my bookshelf. The books are listed alphabetically in title order. Also, Topic Organization (below the matrix column for each individual book) should give you a pretty good feel for the nature of the book's content. Clicking on the "blue" title of a book listed in the Information Summary will take you directly to the detailed information for that book. Maccaffertium sp., Stenonema sp., Stenacron sp. -Baetis, Diphetor, Labiobaetis and Acerpenna sp. - Centroptilum and Procloeon sp. - Hexagenia limbata and related sp. - Heptagenia, Leucrocuta and Nixe sp. They are all excellent. Each has its own "treasure trove" of information. However, as stated earlier, it is my hope that this article will have provided sufficient information for you to choose the book or books that best satisfy your particular needs. However, if you are left with any questions, I would be more than happy to answer them. Roger Rohrbeck, a flyfisher, fly tyer, and entomology enthusiast from the state of Washington can be contacted through his website, FlyfishingEntomology.com or on FlyTyingForum.com - Entomology Forum, where he participates as Taxon.